See that signs are placed at bridges where Northeast Creek or its tributaries cross primary state highways and that they are maintained. Work to identify in some way the crossings by other streets, roads, and trails. Distribute postcard-size maps of the watershed. Work with schools and home schoolers to increase awareness of the Northeast Creek basin and watershed and how it functions. 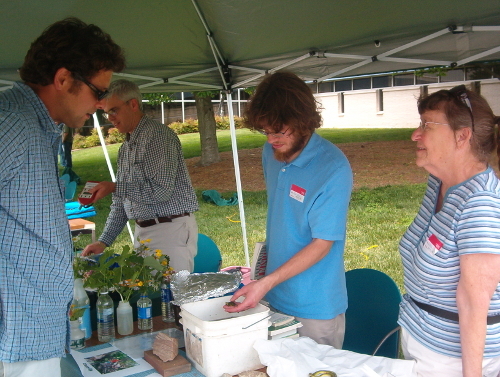 Volunteer to help with tabling at environmental events like Durham Creek Week or Earth Day. Arrange for Northeast Creek Streamwatch to table at community events anywhere within the Northeast Creek basin and watershed. Distribute business cards with the Northeast Creek Streamwatch web site address. Participate in the Northeast Creek Streamwatch Creek Critters puppet and parade unit. Explain how functioning watersheds cleanse water in two ways: retention and seeping into the groundwater with soil and bedrock filtering out impurities; uptake by plants and transevaporation as pure water vapor into the air. Distribute lists of plants that improve wildlife habitat and the overall functioning of the environment in the watershed. Participate in tabling to explain the Northeast Creek basin and watershed to people attending events. Explain the inventory of plants and animals and the unique patterns of relationships among the plants and animals of the Northeast Creek basin. Explain the inventory of historic places, historic houses, and artifacts in the Northeast Creek basin and the story of human settlement of the basin. Appear at public hearings when actions affecting the watershed are up for decision. Write to elected officials about issues related to the Northeast Creek basin and watershed.